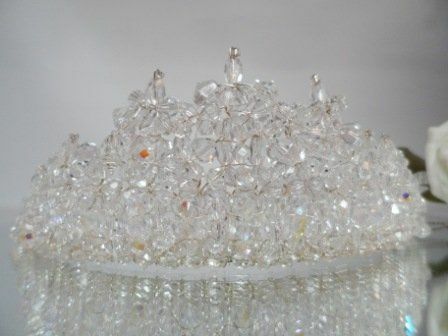 All of my tiaras are handcrafted by me, with the utmost care and attention to detail. All pieces are handmade to order. This means that we can alter your chosen design to suit your preference. You may need a little more or less height on a tiara, or you may need an extra long hair vine. Please contact me regarding your requirements before ordering, so I can advise you of availability and cost. Most designs can be made in any colour from my extensive range of Swarovski crystal and pearl colours shown on my colour charts page. 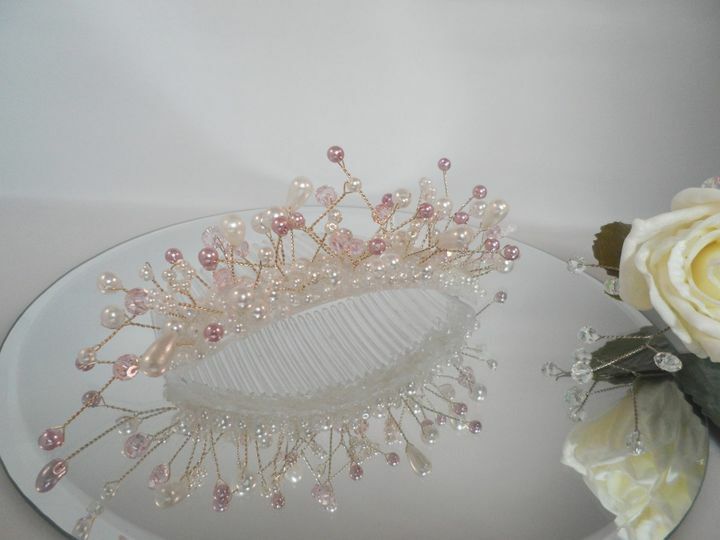 Most designs are available in either silver or gold plated coloured wire.I can offer advice regarding styles and colours that will be best suited to your hairstyle, dress and overall theme. If you don’t find what you’re looking for on my site, I also offer a bespoke design service. Tell me your ideas and I can make it happen! Please see my Bespoke design page for further details. All pieces are handmade to order so can take up to 4 weeks to complete. This will depend on how busy I am at the time of placing your order. You will often receive your order much quicker! If your order is more urgent, I may well be able to complete your order according to your time scale. However, please contact me before placing your order, to ensure that I am able to accommodate your request. 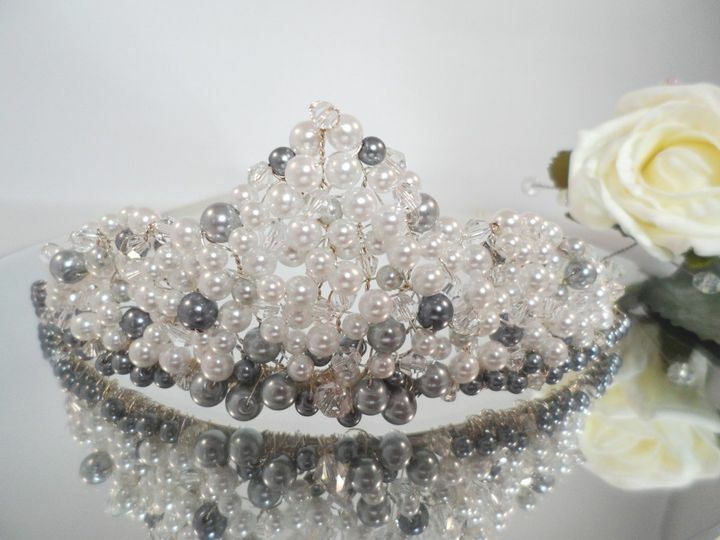 I ordered 3 side tiaras from I do tiaras they are wonderful , Sarah designed my tiaras to suit me with matching colours to my bridesmaid dresses , she was so helpfull and friendly and provided a sample picture before making the final ones. A truly proffesional company that I can't reccomend enough! Can't wait until my wedding day to see them all on ! Sarah is AMAZING, shes extremely creative and has a keen eye for detail. She allowed me to try various Tiara's and hair slides and helped me to chose the right one. 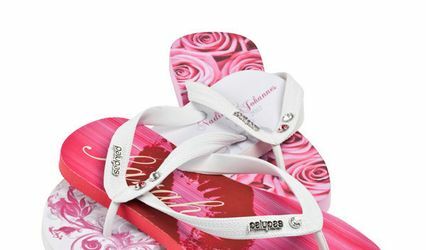 The quality of her products are excellent, the value is excellent and delivery excellent. I cannot wait till our wedding day and to show off all my little extras with the hair slide sparkling in the sun and the bracelet Sarah kindly made in colours to match our theme. I will definitely buy from Sarah again absolutely no doubt about that. When I was looking for accessories for myself and my bridesmaids I knew what I wanted but couldn't find it anywhere. I came accross Sarah and I do Tiaras and she could not have been more helpful. She helped translate the style I was looking for into a practical design in our exact colour scheme. 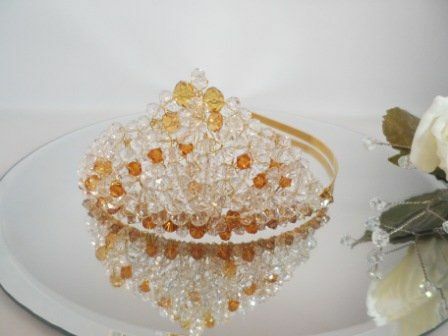 After our first meeting she made up several versions of my tiara based on my ideas for me to choose from at no extra cost and was happy to make any alterations for me. 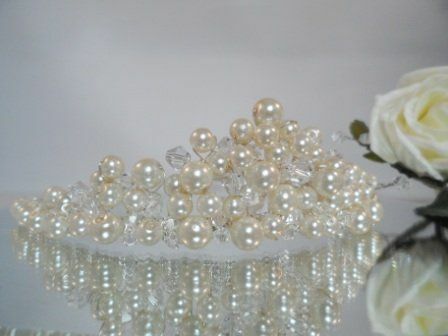 As well as my tiara which was made of pearls and had little ivory roses embedded in it, she also made me matching hair twists with pearls, chrystals and roses. We had burgundy bridesmaids hair slides to match in various sizes and fastening styles to suit their different hair types and she even made me tiny little hair slides for my one year old flower girl. As well as hair pieces, Sarah made me pearl and chrystal jewelry sets for each of my bridesmaids using the same materials so they were a perfect match. Nothing was too much trouble, the service was fast and efficient and the value was outstanding. All of the accessories looked lovely on the day and worked perfectly. I cannot recommend Sarah highly enough.